Ever since I’ve known her, my friend Kelly has been a seeker. When she wasn’t actively seeking, she wandered. And—again, at least since I’ve known her—she’s done all that seeking and wandering in costume. 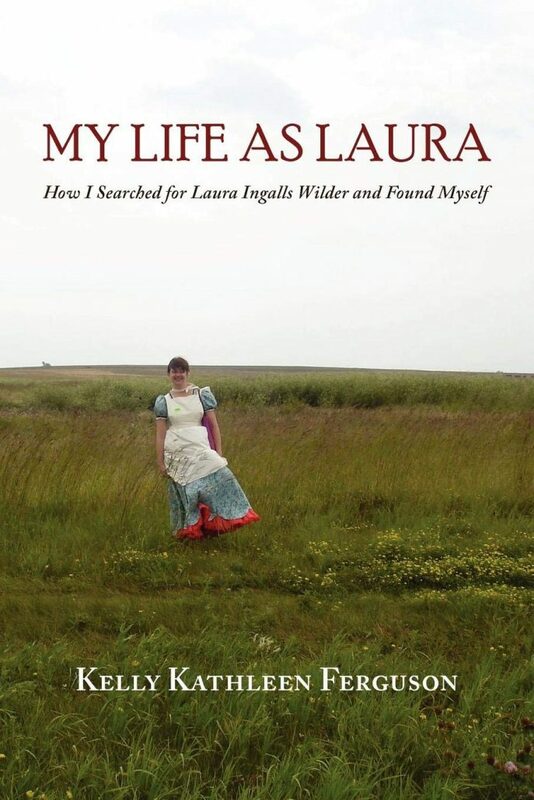 So it was no surprise to me that she donned a prairie dress for her trip through Laura Ingalls Wilder’s landscape. Yes, I’m reviewing the work of a friend. I can’t be objective about My Life as Laura, a road trip-memoir that charts the insights a woman can glean when armed with a reliable car, a flouncey skirt and straggling bonnet, and too many dinners at the Dairy Queen. But at HungerMountain we publish only Reviews Gone Sideways. My “sideways” challenge: to do a review of Kelly’s book that only a friend could write. When you cloak yourself in swaths of pastel cotton and an attitude of extreme emotional reserve, it’s easy to avoid meeting people. On the other hand, when you decide that you are called to write sentences that will never fully live if you are the only one who sees them, you have to learn how to be a joiner. When I joined the North Carolina Writers Network seven or eight years ago, then registered for one of its writing workshops, I was destined to rub my swaddled elbows with people who—cringe—do not aspire to disappear. I clocked the bleached ponytail, the fake fur collar on the short jacket, the tight, pink, glitter-speckled tee-shirt—yegads, a bare midriff!—then looked down at my crisp story, freshly printed and paperclipped and just as tidy as my new sweater-set. DISmissed. Plant, milk, bake, sew, churn—Laura always got the job done. I puttered my Big Wheel around the cul-de-sac, a life devoid of action verbs. Clearly, I was living in the wrong century, with the wrong family. Our pantry was stuffed with a cornucopia of Fudge Deelites, Little Debbie Swiss Cakes, Nutter Butters and Chips Ahoy, but I read with fascination about Laura’s Ma who brought out a tiny bag of sugar for company, carefully doling out the granules. Not to be outdone, I rationed my M&M’s, denying myself the green ones for minutes at a time. I best helped my family by leaving them alone and reading in my room, so that’s what I did. I splayed my body like a starfish on the pink frilly bedspread surrounded by white princess furniture. There, as Laura, I relived my past life as Pa’s right-hand girl. We forged bullets to protect the home and provide meat for the family. We built a door on the log cabin in the Indian Territory. We made hay while the Dakota sun shone. Pa said time and again how he didn’t know what he’d do without his Half-Pint. Without me, everyone would have died, their bones picked over by wolves and turned to dust on the high prairie. Kelly was an annoying kid in everyone’s way, but Kelly as Laura mattered. Back in my [undergraduate] philosophy days, I studied Heraclites, the ancient Greek who made the claim that no man steps in the same river twice, for it’s not the same river and he’s not the same man. For years I had stood in the same river thinking I could defeat change, but what I discovered is that even if you stay put, the river changes around you. Years elapse and there you are, waterlogged and shivering, wondering where the party went. It seemed everyone I knew had passed me by. Maybe they moved to Seattle, San Francisco or New York. Maybe they were married with children. Maybe they established meaningful careers. I wasn’t jealous of anyone in particular, but I was very jealous of everyone in general. Yes, Kelly was great, Kelly was funny. She would reassure me whenever I wondered why on earth I was even trying this damn writing thing. Better, sometimes she could distract me from myself by sharing her own soul searches and fears, in reply to which I would fire off an obscenity-laden pick-me-up that would cheer us both. But even as I enjoyed our long-distance, virtual swapping of intimacies, I didn’t fully grasp, then, why Kelly was so great, why I found her so funny. Why was she able to bring me out of a dark mood with such ease? Understandable, this incomprehension, because I had to see a third Kelly incarnation to fully grasp what was happening to my friend and to fully appreciate why I admired her so much. Montana fulfilled my starry-eyed expectations. A river ran through it, rugged and improbable as any dream. I belted whisky with grizzled men in outpost watering holes. There were osprey and moose. I gripped tin cups of coffee and shouted, “Yar!” at the snowy peaks. I even met my cowboy in the form of an information technology whisperer/poet. We forged a romance, our bodies pressed against a keno machine at the Silver Dollar Bar. Home, pondering, swapping e-mails again, I got it. I hadn’t been drawn to Rockband Kelly despite that bared midriff and hot pink lipstick and rhinestone belt—once I’d heard her speak, and read even a paragraph of her work, the high heels and hairspray and fake fur were very much a part of her charm. Yoga Kelly showed far more skin than I would ever dream of baring in public and the restless power Cowgirl Kelly wore with her suede took up the space of four women. I knew her to be a deeply sensitive, sometimes easily wounded woman with a heart the size of a refrigerator. I knew well that she was often full of the same fears I lived with myself. Hell, sometimes I was the one talking her down. And yet… for her? Invisibility is not an option. Her resistance to the dress lasts in earnest for only a couple of hours, wiled away in a hotel room, where, after gnawing a stale bagel and proving that the faucets were in good working order and the ice bucket did indeed hold ice, she plucks up her courage to emerge properly clad for her journey. Despite the much-appreciated detail of her struggle, it’s clear she stared down the fear with relative ease. Of course she did. She’s been staring down that fear for at least seven years. Kelly’s Laura road trip was a conscious task of self-discovery for her—and now for us—by way of a critical review of America’s Manifest Destiny, meditations on pop culture, wry and insightful social commentary, and a crash course on what makes the story of the Ingalls Wilder clan relevant now. But why the costume? I dare to say that another way to read the trip is this: an excuse for one grand romp in an outfit that just doesn’t have a modern equivalent—a two-week intensive in identity-construction worth a few years on another coast, say, clad in an all-leather ensemble, or leopard print, or a trench coat and wise-guy shades. My Kelly doesn’t have the arrogance of a strutter but she’s got the moves. And always—depending on what she’s learning about herself in that moment—the outfit. I can be so brave only on the page. I last saw Kelly in the summer of 2008. She was padding around a tiny New Orleans apartment in bare feet, a fluttery floral print dress, and long, wavy hair the shade of chocolate: Southern Belle Kelly. When I asked her a few months ago to contribute to Hunger Mountain’s Another Loose Sally, I eagerly awaited her author photo. She lives in Athens, Ohio, now, finishing up a PhD in creative nonfiction. I was certain Southern Belle Kelly would be no more and I was right. What a pleasure to open the photo of my pretty, big-eyed friend, and see a chic dark bob, a simple and flattering black outfit, the confident smile of darkened lips. Author Kelly.